This eloquent, in-depth account of an extended African American family’s grueling eight-year recovery from Katrina demonstrates how greater cultural understanding would enable disaster recovery organizations to better serve affected communities. 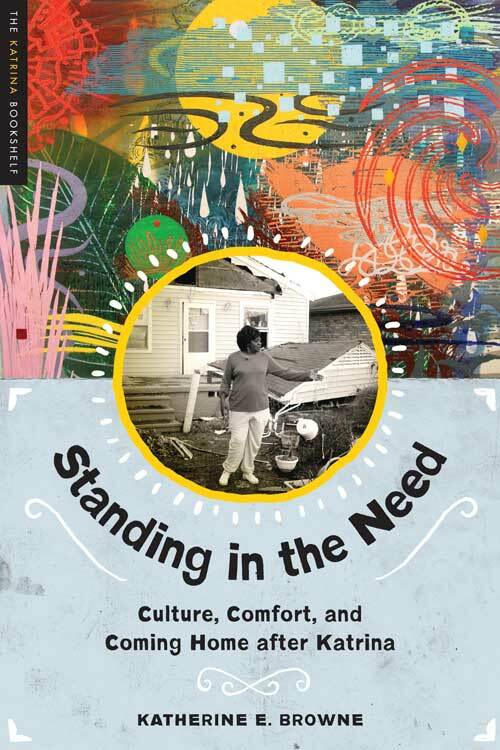 Standing in the Need presents an intimate account of an African American family’s ordeal after Hurricane Katrina. Before the storm struck, this family of one hundred fifty members lived in the bayou communities of St. Bernard Parish just outside New Orleans. Rooted there like the wild red iris of the coastal wetlands, the family had gathered for generations to cook and share homemade seafood meals, savor conversation, and refresh their interconnected lives. In this lively narrative, Katherine Browne weaves together voices and experiences from eight years of post-Katrina research. Her story documents the heartbreaking struggles to remake life after everyone in the family faced ruin. Cast against a recovery landscape managed by outsiders, the efforts of family members to help themselves could get no traction; outsiders undermined any sense of their control over the process. In the end, the insights of the story offer hope. Written for a broad audience and supported by an array of photographs and graphics, Standing in the Need offers readers an inside view of life at its most vulnerable. Browne is a professor of anthropology at Colorado State University. She has published two previous books and produced two documentary films, including Still Waiting: Life After Katrina , which also portrays the family in this book. It has been broadcast on PBS stations in the United States and Canada. Browne is the recipient of the American Anthropological Association’s 2018 Franz Boas Award for Exemplary Service to Anthropology. Scattered across hundreds of miles of coastal and wetland areas of southeast Louisiana, the wild red iris bows gently with the coastal breezes. Its coppery blooms with lush red inner margins and tall green stalks are right at home in this environment of grasses, shrubs, and cypress trees with knees that spike up out of the water. Long before people arrived, iris plants of many hues spread their rootstock in all directions. Like other native rhizome plants, their growth habit helps bind the soil and protect the wetlands from erosion. The rhizome requires no pollination or germination; it is self-sustaining, hardy, and enduring. The story that unfolds here involves a human rhizome, a large family rooted to the same bayou in southeast Louisiana. The family shares a life source, has endured the greatest tribulations, and brings beauty and stability to the environment. In August 2005, members of the family faced violent change, and despite the strength of their rhizome and its rootedness to place, it wasn’t clear for years whether their special lives in the bayou environment would recover. Hurricane Katrina tore into the Gulf Coast, bringing fright and ruin and heartbreak. It ripped open the collective American psyche and, for a brief moment, left a void. That space within fresh disaster is quiet and terrifying, and in the stillness we glimpse the human condition of impermanence. Those people enduring the shock and grief of the disaster needed every possible comfort. They needed every shred of understanding about what would help restore their lives. Instead, the system deployed to secure their recovery and help them heal piled on new hardships and, in the years to come, increased the suffering of survivors and prolonged the time it took them to get their lives back in order. The chapters that follow chronicle the lives of this family and the shifting terms of their ordeal over the course of eight years. From them, I learned how material loss merges into the pain of the heart. I learned about their sense of belonging and comfort, where these come from, how they matter in wretched situations, and how living without them created a social pain that was largely unnecessary. The time required to move from ruins to a rebuilt community took more years than anyone expected, and the recovery cost more lives and created more hurt than anyone imagined possible. But the people whose story I tell do not think of themselves as victims. However mistreated they were, they maintained a sense of dignity and humanity. That dignity is conveyed in the book’s title, drawn from the African American spiritual “Standing in the Need of Prayer.” The lyrics evoke circumstances that are beyond any individual’s ability to overcome: precisely the situation this family encountered during the recovery. The deepest hurts of human life, it seems to say, can only be lifted by giving in to the vulnerability of being human and reaching out to a higher power for relief. As with the family’s own communal form of life, this individual articulation of need occurs in the midst of a black congregation in which the collection of voices rises to create a whole, unified plea for help. This story takes shape in three waves. “Part I: Shock Wave” follows the family members’ evacuation to Dallas and the adaptations they made to life away from home. Connie Tipado, the Dallas relative, becomes a critical intermediary and a model for what I came to see as the key to recovery success. “Part II: Wave of Trouble” begins as family members return to their home environment, where the brief honeymoon period transitions into months and then years of hardship caused by institutional approaches to recovery. In the absence of an advocate, cultural divides between the family’s way of life and the demands imposed by outsiders in charge become the real source of heartache. “Part III: Wave of Reckoning” identifies the terms of resolution, and its costs.